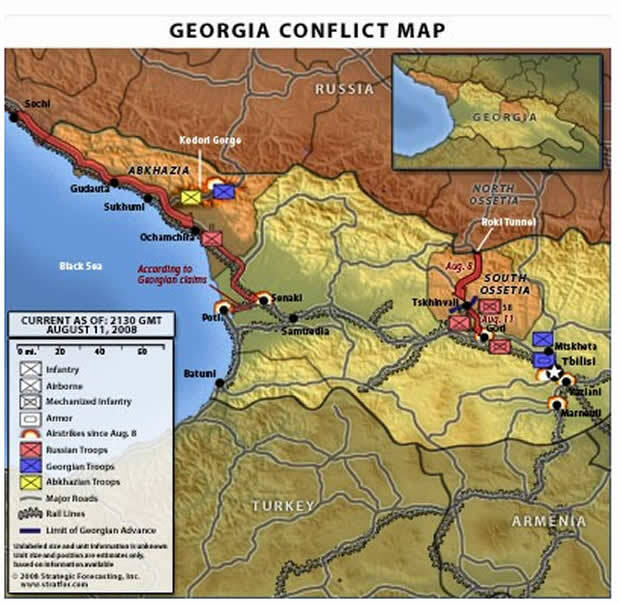 The Russia-Georgia conflict that exploded on the scene on Friday of last week, following the Russian invasion of initially South Ossetia and later Abkhazia and Georgia proper. Now a week on the sequence of events are becoming much clearer as to what actually transpired, and presents a picture of a resurgent Russia, finally emerging from the collapse of the Soviet Union which at one point threatened the disintegration of the Russian Federation itself. Following months of building pressure between Russia and Georgia that included Russian pressure exerted upon Europe and America in preventing Georgia's membership of NATO by means of Russia's role in the war on terror and the Iranian nuclear situation. Meanwhile Russia continued to build up its military 'peace keeping' presence within the two break away regions, some months in advance of the outbreak of open warfare. June / July 2008 - Military skirmishes and artillery exchanges echo around the two break away Republics, the Russians blame the Georgians as the situation deteriorates week by week. On July 9th Russian planes enter Georgian airspace to coincide with a visit by U.S. Secretary of State Condoleezza Rice. Russia had also been upgrading Russian positions in the breakaway regions during the summer months, including increasing the number of peace keepers deployed to approximately 800 from 500, and building new fortifications. July 15th - US and Georgian forces start a 2 week joint military exercise near the Georgian capital Tbilisi aimed at preparing Georgian forces for fighting insurgents in Iraq. 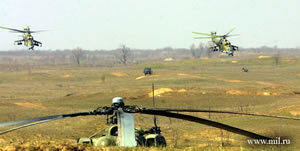 The Russians also at the same time conducted a large scale military exercise North of the Georgian border called "Caucasus 2008", which involved the scenario for the rapid deployment of 8000 personnel, including 700 armored units into South Ossetia and Abkhazia. August 1st to 6th - Military exchanges between South Ossetia and Georgia continue to escalate with Georgians shelling South Ossetia and the break away republic shelling Georgian villages. Many of the residents of South Ossetia start to cross the border into North Ossetia. 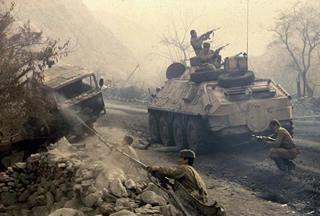 August 7th - Georgian forces enter South Ossetia following an intense barrage of the city of Tskhinvali, to coincide with the start of the Beijing Olympics.This attack of South Ossetia that involved more than half of the Georgian 30,000 strong military would have been planned many weeks if not months in advance. The goal clearly was to seize control through overwhelming use of force against Russian peacekeepers number about 500, the assumption was that the Russians would not retaliate militarily. Whilst the Russians were clearly fully aware of Georgian intentions and had plans and forces in place ready to counter the Georgian attack. August 8th - Russia forces expel Georgian troops out of South Ossetia - Georgia briefly claims to be in total control of the capital of South Ossetia, Tskhinvali before a huge influx of Russian forces including airborne troops backed by over 50 aircraft force a rapid retreat of Georgian forces out of Tskhinvali. August 9th, 10th, the Blitzkrieg and rout of Georgian forces continues as Georgia seeks a cease fire as the Russian forces move deeper into Georgian territory as well as opening a second front from Abkhazia. Any delusions President Saakashvili had of a slow slumbering Russian military machine are completely shattered as panicking Georgian forces abandon positions to head deeper into southern Georgian territory. August 11th, 12th - Russia expands military operations by targeting Georgian ports and enforcing a naval blockade, whilst Russian armour moves deeper into Georgian territory by seizing the city of Gori. Georgian forces in retreat head to defend the capital Tbilisi as a column of Russian armour is seen as being less than one hour from Tbilisi. August 14th - Poland and US sign a missile defense deal which angers the Russians. Analysis - Why Did Georgia Attack ? Clearly the Georgian leadership in Tbilisi grossly under-estimated the Russian response to an attempt at bringing the break away region of South Ossetia back under Georgian control. Saakashvili's government had in recent months been bolstered by soundings out of Washington of military support that included eventual membership of NATO as a reward for their continuing presence of armed forces in Iraq. Georgian intelligence may also have been in receipt of mis-information that the Russian response would be muted as since the breakup of the Soviet Union the Russian military had shown it self to be a slow slumbering ageing giant made up of unwilling eager to desert conscript forces. The recent events now change this view of the Russian military which clearly has the capability to deploy rapidly and efficiently within its regional sphere of influence. Either way the Georgians hugely miscalculated, instead of a muted Russian response it now appears that the Russians had been awaiting on such a Georgian action and had their military fully mobilised and prepared for a counter strike on Georgia proper as the earlier military exercises had prepared for. The Russian plan appears to be for the annexation of the breakaway regions by means of degrading the Georgian military machine, economy and by means of creating buffer zones around the break away regions therefore more loss of Georgian territory. This also sends a clear warning to other former eastern european soviet union states with sizeable Russian populations that Russia will not tolerate NATO expansion into the east, and when the chips are down NATO guarantees may prove worthless in the face of Russian military action in response to similar excuses of attempting to safeguard sizeable minority russian populations elsewhere. More importantly this is a warning shot to Ukraine that has already been subject to Russian interference in the form of poisoning President Viktor Yushchenko and the shutting of the oil supplies during the winter of 2006. More than 25% of Ukraine's population are of Russian origin, therefore the Russian action in Georgia threatens a potential break up of Ukraine, unless the Ukrainian government conforms to Moscow's wishes. The Ukraine has already been warned against NATO membership that would result in Russian nuclear targeting of Ukrainian cities. Being a pseudo totalitarian state, Russia has always sought to use its population as pawns in a great game, more than willing to sacrifice countless millions in the name of the Russian Empire. Many actions of recent years have demonstrated this crass disregard for their own population in which ordinary russians realise this that they have far more to fear from the actions of their own government than any outside threats. The biggest recent example of this were the wars fought in the name of saving the resource rich breakaway republic of Chechnya, that sought greater autonomy from Moscow and was brutally and violently crushed with more than 250,000 civilians killed, and virtually the whole country flattened. After years of conflict, Moscow eventually managed to install a stooge President to oversee the ruins of the capital city Grozny, supported by several thousand henchmen and upto 50,000 occupying troops that seek to maintain Russian control. Therefore the Russian actions in Abkhazia and South Ossetia have little to do with the defending the people, but rather a move to grab territory and destablise Georgia so as to reinforce Russia's position as the regional super power and to tighten its grip over Europe's energy supply as Georgia was increasingly seen as as a significant transit route for oil and gas supplies by passing Russia that has been prone to flex its muscles in recent years by cutting supplies to European countries in times of political disagreement. Meanwhile the american's have been eager to expand NATO whilst they can to encircle Russia whilst it still remained weak, became carried away by extending the possibility of Nato membership to the Russian satellite states of Ukraine, Belarus, and Georgia that will have been the real spark that initiated the current sequence of events in Georgia, as it would have emboldened the Georgians to act and angered the Russians into drawing a line in the sand. Which now clearly sends a warning to the other countries pursuing Nato membership that a. Nato membership would not deter the Russians from taking military action. and B. that Nato membership may not be followed by military support from NATO countries in defence of these nations. Clearly extending Nato membership to these countries now poses a risk to Nato of being drawn into an unnecessary war a nuclear Russia that could literally spark a third world war, therefore makes full nato membership of these countries now less likely as Nato rethinks its strategy towards Russia. Similarly this week Poland signing up to the American missile defence system is not going to help matters, as a few defensive missiles would be of little defence against thousands of Russian missiles nor prevent Russian military hardware from crossing the Polish border. Russia sits on huge reserves of oil and gas that it supplies to Europe through a vast network of pipelines. Now Europe increasingly finds itself politically crippled in responding to Russian military actions. This increases the risks of Russian anger resulting in the oil and gas taps being turned off as Russia seeks alternative markets for its hydrocarbons such as China and India. The developing alternative energy route through Georgia and Turkey is now at risk as Russia seeks to diminish the competition. The future is definitely not bright for European energy consumers, where we can expect supply disruptions as a consequence of future EU political disagreements with Russia. This was a great article that covered all of the points of the geopolitical arena facing the United States, Europe and Russia in the coming decades or more. The geopolitical chess match has caught the Bush Administration again looking like the idiots that they are along with the short-sighted and oil mutts of the neoconservative criminals elite. I am fearful that this current Republican Administration in their Wild West Cowboy mentality will throw gas on the fire by doing something far more stupid then they have already shown for the past 8-years. Something like invade Iran and spark a hugh fireball that will destroye our economy and military for the next twenty years. I can not wait until we have an intelligent White House in the near future! Hopefully then we can become again part of the solution and not the problem.